Plazas that make up the Toll System. This level allows to generate information for its correct administration. 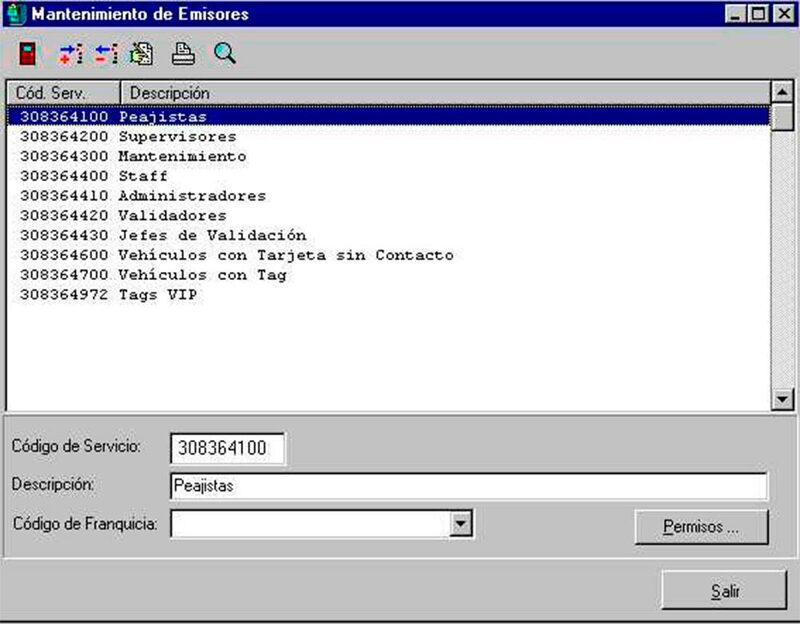 The sub-systems that make up the Management Level work in a server automatically, without the intervention of any operator. The management system concentrates all the information generated in all the collection points and administers all the system. 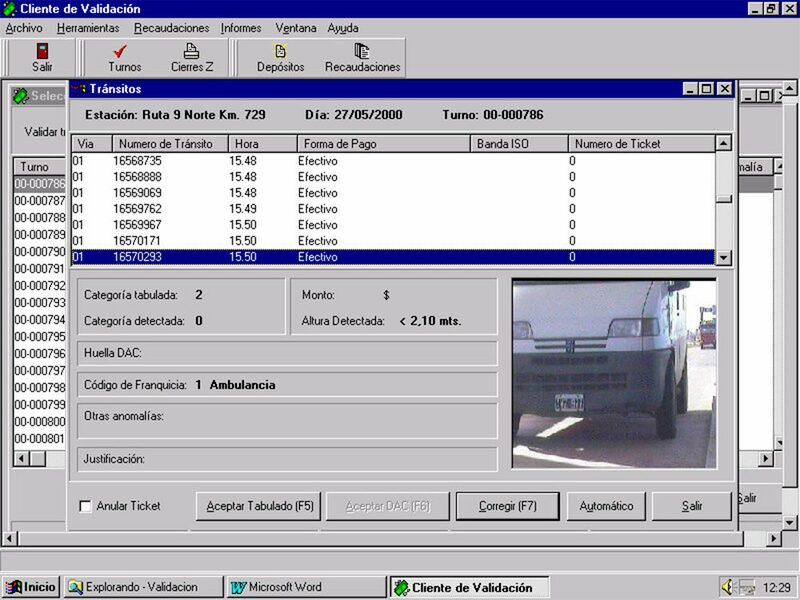 In this level, all the data generated in the toll operation is unified. Its integrity is verified, the provisional information is consolidated and the information security mechanisms are managed. Besides, the information in this level is stored in a data base that allows a historic log request. Lastly, an interface with the administrative system is produced so as to generate all the administrative and accounting information required by this system. Internal control, consolidation and audit of data originated in the Toll Plazas. It administers all the modifiable tables of the Toll System. 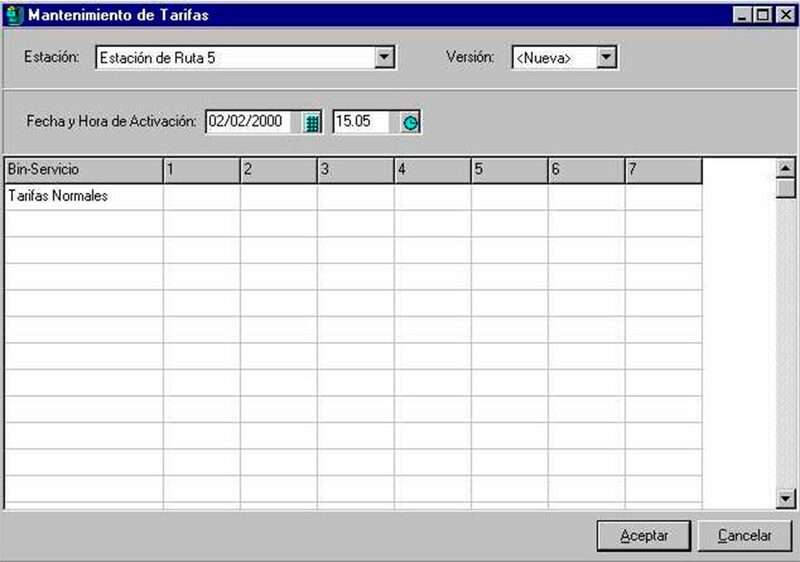 When one of them is selected it is possible to add, delete or modify a register. Types of documents: It shows the different categories of legal documents that are used in the system. Lane messages: This table contains the predetermined messages that the lane operator can send to the toll plaza supervisor. Correction Codes: This table contains the correction codes that can be assigned to the anomalies occurred in the Toll Plaza Collecting Lanes Anomalies’ justifications: This table contains the justifications that the lane operator can assign to the anomalies produced in a transit. Payment modes: This table contains all the payment modes accepted in the system whether being active or not. The system will produce detailed and reduced information about traffic, income and transactions. All cash transactions, bank credit cards, etc will be supported by receipts and original documents. A daily state of income conciliation related to collecting activities will be prepared. This report issues information with the number of total transits according to payment modes, exemptions, neighbors and per toll plaza for the selected labor day. This report issues information with the amounts collected through the different payment modes for each labor day in a selected range of dates and for the selected toll plaza. – Total amount collected by each toll plaza. This report issues information with the number of transits registered for each labor day in a selected range of dates entered for the selected toll plaza. – Modify the countable closing time and the tolerance allowed. – Define for which type of anomalies the vehicle photograph must be registered. – Validate Z closing: Fiscal Controller sales report validation. – Validate shifts: the shifts validation allows to inspect all the settled shifts and assume corrective actions in all the transits that present an anomaly. – Validate amount differences: Validation and justifications of differences in shifts collections per countable working days, shift and bag. The Real Shortage amount of an operation shift can be obtained here. – Update Booth operators’ dossiers: This process keeps the list of dossiers of the CASISA booth operators and supervisors’ updated. This is useful for the monthly report of collections’ differences to be discounted from salaries. – Interchange management information: This process incorporates the management information manually generated in the toll plazas. – Generate countable interface: communication interface management with JDE System. – Generate Z closing interface: Communication interface management with JDE system. – Rehabilitate a deposit conciliation: Habilitation of an already settled bank deposit to be able to associate it again to another Deposit. – Total amount recounted by the collecting company per toll plaza. deposited by the same company. – Total amount recounted by the collecting company.